The little girl wearing pink party shoes topped with bows smiled from her seat in a Los Angeles immigration courtroom. The 7-year-old is happy now that she is worlds away from the violence in her native El Salvador. Gang gunfire once forced her to hit the floor inside her home. She fled Central America last year with her great-grandmother to join her mother in the U.S. At the Mexico border, authorities separated the two, and she lived in a youth facility for about a month. She cried so much that staff members gave her extra phone time to talk to her mother, the mother said. She was eventually reunited with her mother and is now seeking asylum. Her case, which was in court Tuesday, predates the Trump administration's "zero-tolerance" policy calling for the criminal prosecution of all immigrants stopped on the southwest border. But it illustrates how children arriving from Central America have long faced the prospect of family separation and navigated a complex legal immigration system that can take months or years to render a decision due to a massive backlog of cases. The fight over children being separated from their families at the border intensified Tuesday as President Trump insisted that he is powerless in stopping the policy that his own administration enacted weeks ago. 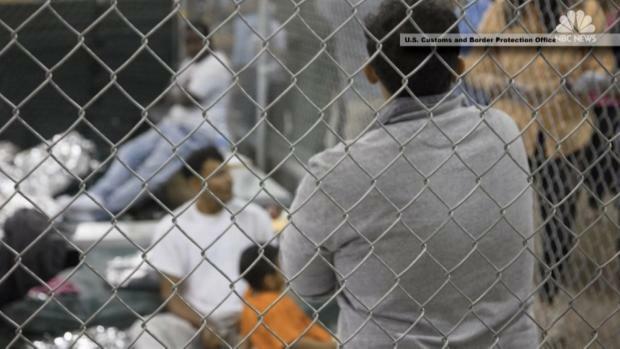 The U.S. government separated more than 2,300 children from their parents in recent weeks in a policy that stoked widespread outrage among both Democrats and Republicans. On Wednesday, Trump bowed to pressure and signed an executive order ending the separations. It was a dramatic turnaround for the president, who had insisted, wrongly, that his administration had no choice because of federal law and a court decision. Many of the affected children may soon find themselves in an immigration courtroom somewhere in the United States as they make a case to stay in the country legally and avoid deportation. At immigration court in Los Angeles, Judge A. Ashley Tabaddor had more than 20 cases on her morning docket — all of them children's cases, and many of them asylum seekers. Some had arrived a year ago, or even two. All had lawyers and were seeking to stay by seeking asylum or through a government program that provides green cards to abused and abandoned children. The girl and others applied for asylum at an office run by U.S. Citizenship and Immigration Services and were waiting for an interview. The agency in March had more than 17,000 children's cases pending review. The judge told the lawyers, children and parents in the courtroom that recently it had been taking longer than the month or two that young applicants previously waited for an interview. Other cases were mired in confusion. A 16-year-old girl had been telling the court she lived in Los Angeles with her aunt when in reality she had moved to Texas to stay with her mother. "Who gave you permission to move to Texas?" Tabaddor asked the teen before ordering her to return to her courtroom with her mother or aunt in September or face deportation. "Lying to the court is unacceptable. It is going to cause problems and is already causing problems." Tabaddor later sought to sort out a 19-year-old asylum seeker's living situation since he moved from an earlier Southern California address. His mother was in Guatemala, he said, and he didn't understand what the judge meant when she asked about his biological father, since he had been staying with a man he called his stepfather since arriving here. She told his attorney to get to the bottom of the situation and determine whether he was eligible for immigration relief. For the rest of the hourlong session, the judge juggled the cases of an 18-year-old Guatemalan who didn't want to move with his aunt to Bakersfield, a 20-year-old Guatemalan who will have his asylum case heard next April and others. She then asked the court's Spanish-language interpreter to walk out to the hall and look for a Salvadoran immigrant who didn't show up for court even though she had a lawyer. When no one answered the calls, the judge issued a deportation order for her. The 7-year-old girl's mother, Jennifer, asked that her full name not be used out of fear the government would seek to have the family deported. The 25-year-old mother worries about getting deported since asylum cases are getting harder to win even as gang violence worsens back home. Her daughter, clutching a cardigan, lowered her voice and her eyes when she recalled living in El Salvador. "It's horrible," she said. "Dangerous." And she remembered how soon after she reached the United States she pounded her fists on the window and cried when border officers took her from her great-grandmother, who had raised her since she was a toddler. "I went crazy because she was going someplace else," she said. The great-grandmother was later released and now has an immigration case of her own in California, according to the girl's mother. The girl was just 5 at the time, and the stress took its toll as she lived in the youth facility. "She cried and cried," the mother said. "I didn't think they would separate them." About a month later, the girl was sent to live with her mother in Southern California. She said she likes going to the park and school. And again, she smiled. The story has been corrected to remove an incorrect reference to the 25-year-old mother seeking asylum.